Can you remember your favorite Thanksgiving? With the help of this festive writing prompt, your child can polish her creative writing skills. 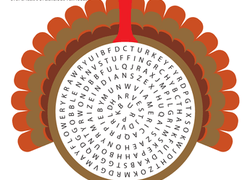 Get into grammar, and the Thanksgiving spirit, all in one worksheet! Your child will review his nouns and adjectives as he reads a couple of fun facts.